Connie's Candy Birthday Card Ideas - Adorable! I'm trying to make something special for my friend who is turning 16. I'm not very creative and want to make a Candy Bar Card so I need help creating a short and simple saying, maybe with 16 pieces of candy for her 16th birthday. Your best option is to read through some of the other great candy bar card submissions and pick out a clever phrase here and there that would go along with the candy choices you have available. As you read through them, keep a pen and paper handy so you can write down your favorite phrases that you discover. Once you've done that, it will be a snap to reorganize the wording into your own unique and adorable candy card for your friend's Sweet 16th. Anyone else have any specific ideas for Miranda for her friend's homemade 16th Birthday card? Share your hints and tips below! What a good idea, Connie! I never thought to use contact paper (shelf paper) to cover the cardboard and make a decorative background for the card. That's a tip I'll be using in future myself. Thanks! Thanks for your comments about the candy cards I submitted. My board looks a little different because I used black-patterned adhesive shelf paper to cover the board first. I do this so that my letters stand out. I will continue to make more and will submit them. I will make another one for October 22. Thanks so much for sending along the photo of your cousins birthday card. I've added it above. It's excellent! Thanks again for sharing. I look forward to seeing more submissions from you in future all over the site (fingers crossed!). How did your cousin like the card? Had she ever seen anything quite like it before? I hope she loved it! Be sure to share more candy ideas when you make them. We always love community involvement! 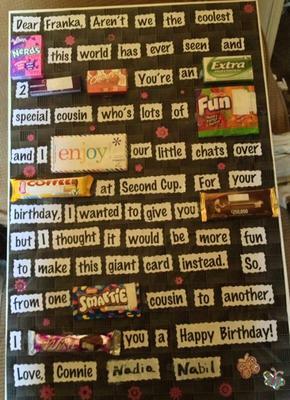 I made this card for my favourite cousin who shares the same birthday with me in August 2013. Aren't we the coolest NERDS this world has ever seen and 2 BUBBLICIOUS CHICKLETS. You're an EXTRA special cousin who's lots of FUN DIP (black out the DIP) and I ENJOY our little chats over COFFEE CRISP (black out CRISP) at Second Cup. For your birthday, I wanted to give you $250,000 but I thought it would be more fun to make this giant card instead. So, from one SMARTIES (black out the S) to another, I WISH you a Happy Birthday!